Find Lake Spivey, GA Homes for sale. View Photos, Maps and MLS Data Now! 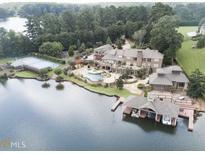 Lake Spivey Estates - Original Home Was Remodeled Into This Incredible Lakeside Estate With A Breathtaking Panoramic View * 4 Full Kitchens * Complete Suite For In-Laws Or Teens With Separate Entrance, Living Area, Gourmet Kitchen And One-Of-A-Kind View * Separate Lake House With Custom Bar & Deck, Dj Station With Dance Floor, Large Bedroom & Loft, And Full Bath * Spa Enclosed Under Deck Flows Outside Into Main Pool That Features A Negative Edge * 5 Slip Dock * Great Basement With Rec Area And 11-Seat Home Theater! MLS#8454180. First United Realty, Inc.. These statistics are updated daily from the Georgia Multiple Listing Service. For further analysis or to obtain statistics not shown below please call EasyStreet Realty at 404-998-4144 and speak with one of our real estate consultants.